The Good Design Awards is a comprehensive program for the evaluation and encouragement of design organized by Japan Industrial Design Promotion Organization (JIDPO). as the G Mark system), established in 1957 by the then Ministry of International Trade and Industry (the current Ministry of Economy, Trade and Industry). At that time, Japanese citizens had a hard time scraping together enough food to get by. This award system was born out of the belief that design was essential in breaking out of this cycle of poverty. Since then, the Good Design Award has been given to outstanding designs for more than 50 years in the pursuit of prosperous lives and industrial development. 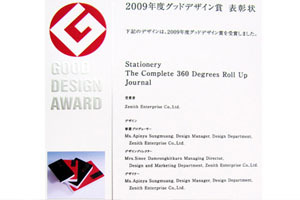 Approximately 35,000 Good Design Awards have been given in continuing these efforts. JIDPO receives approximately 3,000 submissions from more than 1,000 companies and designers every year. These designs are screened by about 70 design experts, who select and recommend those designs worthy of the Good Design Awards. However, the Good Design Awards is not a beauty contest, nor is it an award that assesses the design’s outcome in economic terms. Rather, the Good Design Awards is a system that aims to channel the eminent powers of distinctive designs to build prosperous lives and encourage sound industrial development. Indeed, it is a campaign to brighten and enrich society through design. Today’s Good Design Awards are being recognized in global community proving that design leads to new answers in a variety of domains of human activity, and also offers signposts for tomorrow’s lifestyle to the public, industry and society overall. Design is essential to improving the lives of every individual in the twenty-first century. The Earth Collection is inspired by waste materials, especially paper recycled into a unique pulp. This technique of paper molding, called paper recycled casting, gives designs a three-dimensional form. From paper pulp to design, from design to functionality, the Earth Collection is the perfect companion for a new lifestyle where nature is closer to the touch. selection of premium quality paper products. The company, which specializes in journals, notepads, photo albums and handmade crafted products, soon became recognized as one of Thailand’s leading paper manufacturers. Serving the high-end market worldwide, Zenith Enterprise brands include ZeniCraft (mulberry paper products, stationery collections and greeting cards), ZeniTouch (leather, velvet, suede, silk, canvas and other fabrics), ZEQUENZ (360-degree roll-up flexible journals) and ZA-RA-TA (home decorative and lifestyle items). Prime Minister’s Export Award. The event was arranged by the Ministry of Commerce, and Minster Kittirat Na Ranong and executives of the Ministry attended the event. The Minister of Commerce reported to the Prime Minister that the Department of Export Promotion (DEP) had arranged this for the 20th year, as the highest award for exporters of products and services, for excellent production, design and branding. The services offered by the award recipients are of international standard, and the awardees have reached out to new potential markets and built up a name for Thai exporters and service providers, recognized by the global market. 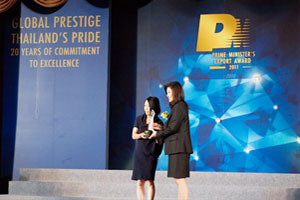 As for the Prime Minister’s Export Award for 2011, a total of 31 companies were awarded, by 32 awards and 5 categories of awards; 1) BEST EXPORTER, 2) THAI-OWNED BRAND, 3) DESIGN EXCELLENCE AWARD : DEmark, 4) BEST SERVICE PROVIDER, 5) OTOP EXPORT RECOGNITION.